Are you one of those people that is still holding on to a road map waiting for the day GPS systems are perfected? I know some of you younger readers are Googling the question "What is a road map?" right about now. I have always loved technology and jumped on early GPS models which all but let me down on just about every trip. Inevitably I would find myself on some back road with a bridge that had a 3 ton weight rating and no way to back up my 15 ton motorhome. Thankfully today's systems are far more reliable and although still not 100% perfect do provide so much value that you can forgive an occasional navigational faux paw. Recently manufacturers have developed RV specific GPS systems that take into account the length, height and weight of a setup to keep you from encountering that 3 ton bridge on that lonely back road. Even RV GPS systems have come a long way since their introduction with manufacturers listening to the suggestions posted by avid RV users. Some new additions to these GPS systems include suggested areas for camping, RV service centers, site seeing opportunities and information about local propane regulations. 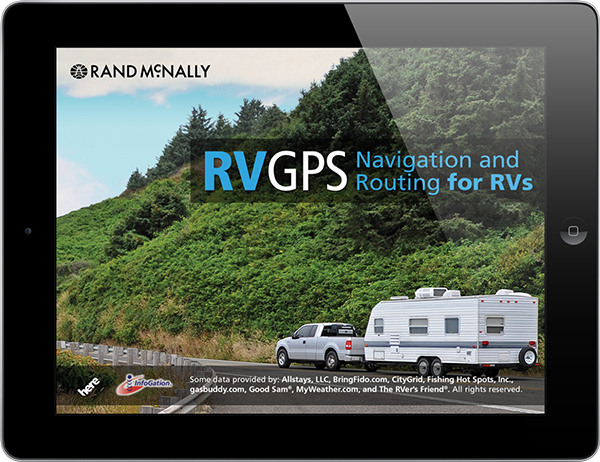 Rand McNally RVND 7720 LM TripMaker RV: This GPS system is designed using innovative technology to help RV users plan, prepare, and enjoy each trip. This award winning system includes lane assists to help users navigate difficult interchanges, a Trails feature for hiking, RV trip prep checklist, Woodalls campground amenities information, Editor's Picks which displays top picks for RV trips and getaways, a warning system which alerts the driver of speed changes, sharp curves, and other potential hazards and much more. Magellan RV9165SGLUC Roadmate RV 9165T-LM GPS Navigator: The Magellan Roadmate has everything the RV user needs to get where they are going and check out the best RV friendly spots along the way. The High Definition 7"LCD screed is easy to read conveniently displays over 6 million points of interest, free lifetime traffic alerts and map updates, Smart Detour, multi-destination routing, auto night view, one-touch favorite menu, and more. Garmin 010-01168-00 RV 760LMT GPS Navigation System: Not to be outdone, the Garmin unit is packed with features specific to the RV user's needs. The pre-loaded maps cover all of the U.S. and Canada and the voice activation features allows you to engage the unit hands-free. Special features include free lifetime traffic alerts and map upgrades, a huge RV parks and directory database of over 20,000 camp sites and 14,000 RV service locations, smartphone link which integrates news and weather for current or upcoming destinations, Garmin Adventures feature which allows the user to record and share videos and pictures from your favorite trips, real views of interchanges for easier navigation, Garmin Base Camp which allows users to pinpoint and locate specific points of interest. If you are considering a GPS system for your RV and have a question, please contact us.